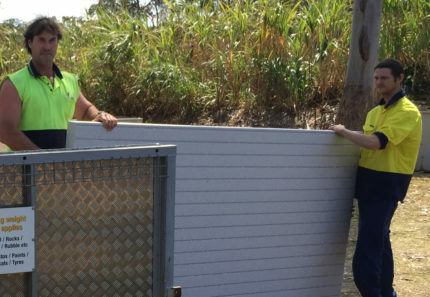 With winter around the corner, many Brisbane homeowners are either looking to, or have just completed a massive garden cleanout. If you’re one such person then no doubt you’re considering ways to remove your garden waste easily and effectively. Now, The State of Waste 2016 report states that the average garbage bin of an Australia household contains 60% organic material, with 20% of this being garden waste. While the average garbage bin may large enough to hold the average week’s waste, what do you do when you have a massive garden cleanout? You could get rid of it bit by bit in each weekly council pickup. But this may take weeks, even months to removal all your garden waste. Thankfully you have many other options, including our garden skip bins, which biasedly, I think are your best option. But today we will look at all your options on hand so you can decide which is best for you. So, continue reading this post as I list 4 effective ways of disposing large amounts of garden waste. After reading through, you’ll have a good idea of which option to go with. Many Brisbane residents choose to use the Brisbane Council’s green waste recycling bins to dispose of their garden waste. This is a cheap and easy way of disposing garden waste; however it isn’t very efficient when disposing large quantities of waste. Brisbane has a very efficient green waste recycling service and they do a great job with waste management and minimisation. All you have to do is fill your garbage bin with your garden waste and it will be collected on your designated collection day. From here, it is send it to a recycling depot for mulching. Ordering a green waste recycling bin may be straightforward, but it is not the most effective way of disposing garden waste. Do understand that you may have to wait up 14 days to have your waste collected. Moreover, there is also a limit to the amount of waste that will fit into a green waste recycling bin. If you’re not comfortable with long waits, or if you have a humongous amount of waste to dispose, a green waste recycling bin may not work for you. In such cases, you should look at other at hand. Many Brisbane residents also choose to dispose garden waste themselves by taking it to the nearest tip. This is a simple solution, given that you don’t need to depend on anybody else to get rid of your waste. All you have to do is to collect your waste, arrange for transportation and take your waste to the tip. I know, this sounds really simple, but in reality, it’s far from easy. It takes a lot of effort to collect your waste, arrange for transportation and take it to the tip. Moreover, it can also be an expensive affair. If you don’t have a ute or trailer you’ll need to bear the costs for transportation and you may also be charged a dumping fee. To make things worse, this process is very time consuming. However, these are not the only reasons why this method isn’t a favourable way of disposing garden waste. The biggest problem with this method is that most people simply don’t know how to dispose garden waste properly and end up dumping it in landfill with general waste, which is extremely harmful to the environment. This process consumes valuable landfill space and moreover, garden, or organic waste in landfills decomposes to produce harmful greenhouse gases. As a waste removal expert, I urge you, if you choose to do this method, be sure to dump your garden waste in the correct area at the tip. Ask for the directions to the green waste dumping grounds. If you’re up for it, you can choose to compost your garden waste into mulch instead of disposing it. For this, you’ll need to rent a chipper and chop down your branches and shrubs into small pieces. You will then a compost bag or a bin and place all your garden waste into it for composting. However, be warned that composting is not as easy as it sounds. Composting requires a lot of effort and unless you’ve handled it before, you’ll be wise to stay away from it. You’ll have to take a lot of care of your compost pile and keep it moist throughout the process. Moreover, you’ll have to maintain a certain temperature level to create compost. Furthermore, composting will make your yard smell awful and may attract flies, rodents and pests which create further problems. Additionally, composting takes months to complete and you’ll need to put up with it for a long period of time. If all of this isn’t enough, renting a chipper will also cost you money – a few hundred dollars per day. Handling a chipper is also dangerous and should be approached with caution. Composting is certainly not the best way of removing garden waste but it is very good for the environment. Unless you’ve done it before, I’ll advise you not to take on this option. 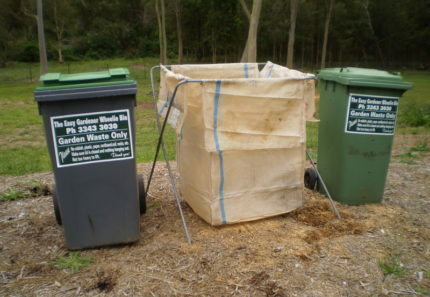 Finally, the simplest and most effective way of disposing large amounts of garden waste is by hiring garden skip bins. 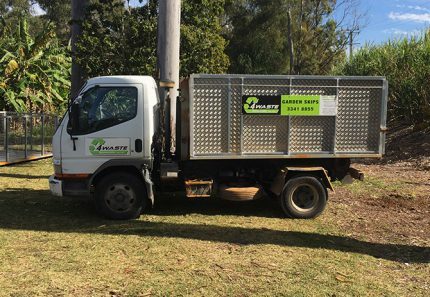 Simply contact a skip bin provider in Brisbane, such as us at 4 Waste Removals and request for a garden skip. The skip bin will be delivered to your location on the same day, or on a date you request. Once your garden skip bin arrives, you’ll have a 5-day window to fill it up with your waste. 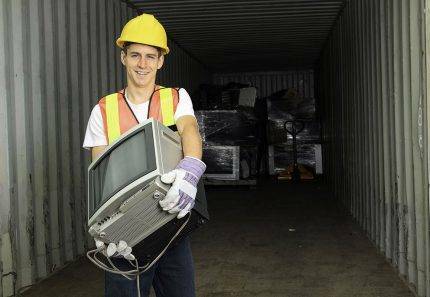 After that, waste removal experts will collect the skip and take your waste away for disposal. As simple as that! Moreover, you can dispose any quantity of waste in garden skip bins. At 4 Waste Removals, our garden skip bins come in two size options –2-6m³ and 2-8m³. Our skip bins feature varying fill levels ranging from 2m³ up to 8m³ and we charge you for the amount of waste you fill into it. Also, by hiring garden skip bins, you can ensure that your waste is disposed properly. We will not send your garden waste to landfills, but we’ll take it to the nearest recycling depot. And, the best part, garden skip bins are extremely economical. You can dispose 2m³ of garden waste for just $140 and 8m³ of garden waste for $499 – far cheaper than the other methods of disposal. Skip bins are certainly the best way of disposing garden waste. 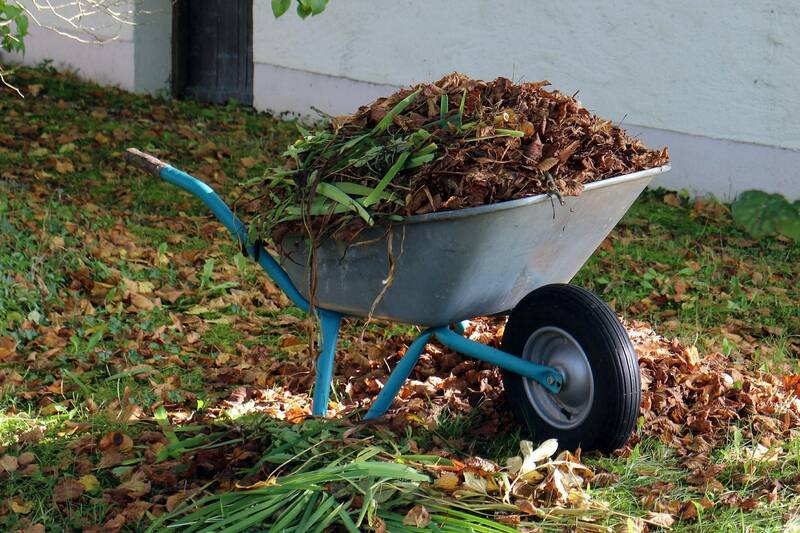 If you’re looking for ways to dispose large amounts of garden waste, then you have several options on hand. You can call your local sanitation department to pick up your waste, drive your waste to the nearest dump, compost the waste in your yard or hire garden skip bins. Of these methods, hiring garden skip bins is the simplest, most economical and most effective way of disposing garden waste. It is also an environmentally friendly procedure and you can get your waste removed in no time at all. And, to hire the best garden skip bins in Brisbane, look no further than us at 4 Waste Removals. Our services are reliable, affordable, timely and effective. Give us a call at 07 3343 3030 to hire a garden skip bin today!